Karla's Korner: Saturday was a wonderful mail day! Saturday was a wonderful mail day! It is now officially Tuesday, though very EARLY Tuesday. It's almost 1 am here on the east coast, but I just have to make this post! I've been trying since Saturday! Life, especially with children, just deals you one thing after another and sometimes you just can't sit still long enough to simply type "Hi!" Ok,I said "Life, especially with children," but everyone has things thrown at them (not literally! Well, sometimes literally, too!) where they just aren't able to sit down for a moment to themselves, children or no children. But they're my excuse right now. But I'm here now, and I must tell you all what a lovely bunch of goodies came in the mail Saturday. I'm in two Secret Pal exchanges, one of them being over at Crochetville. Oh, but my boxies! I opened this small box first from a Secret Pal exchange, so let me show you what arrived! First, the YARN! My Secret Pal sent two skeins of this Elf Eyelash Yarn in "Ginger". 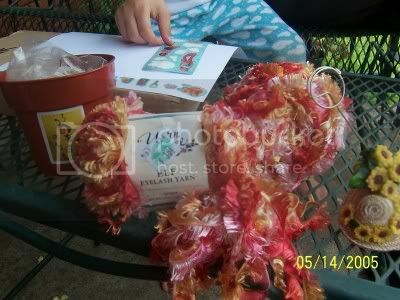 I've worked with eyelash yarn before when I made a scarf and it worked up wonderfully. I will enjoy making something with this, too...probably another scarf! My SP was thinking of my two girls when she packed my boxie. There was this resin flower pot and hat photo holder with beautiful sunflowers. How cute is that?! 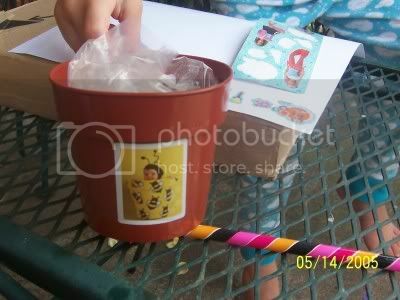 There were also two sticker sheets, two pencils that write in 3 colors, and a puzzle-in-a-pot illustrating a "bumblebee baby" in a flower pot. This reminds me of the Anne Geddes babies. My girls and I have already put this together 4 times, maybe 5! We love puzzles! I hope I didn't leave anything out, SP! Thank you for these wonderful gifts and for including my girls. That was very thoughtful of you! They love getting things in the mail as much as I do! 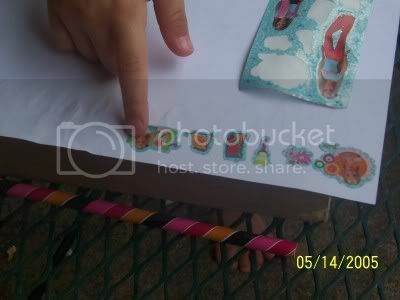 Here are a few photos of my daughter Jessica putting stickers on a piece of paper. And there is one of the multi-colored lead pencils they received. My oldest had already run off with her stickers and pencil! Remember you can click on the picture to see a larger view. The other boxie I received came all the way from Germany and was actually a "Reveal" package from my Crochetville Secret Pal during the last round (Feb, Mar, Apr). I had figured out it was Anna, and yes, Anna, it was because of your ranting on the forum board about how long your package was taking to arrive that gave you away! :) It did take an awfully long time, didn't it? It was fun guessing who you were! Well, this package arrived ALOT more quickly than that first one. I loved EVERYTHING! Anna sent two postcards. One postcard depicts a lot of lovely buildings which she tells me are all within a 5 minute walk from her house! Wow! The second postcard was of Frankfurt, the city where she works. She mentions that Frankfurt is the only city in Europe with skyscrapers! Really? Anna also sent a pretty card whose cover was written in GERMAN! Eeekk! Thanks alot, Anna! You had me scared there. Thank you for providing me with the translation which reads "All the best for Mother's Day". Thankfully, she wrote a note inside the card in ENGLISH! A very nice note which I enjoyed reading. 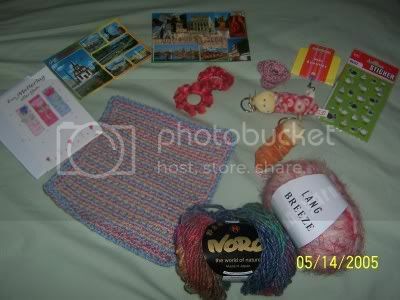 She says that she bought the Noro yarn while visiting Marvie in Stuttgart and the other when she met her in Karlsruhe. Yes, it's well traveled yarn, Anna, and also loved in its new home! I love both of the yarns you sent. I love the washcloth, too. I will definitely be using it. One can never have enough! Sure we can buy them from the store, but those store-bought cloths just aren't as fun to use as these handmade ones. I mean whenever you use one, it reminds you that someone took the time to make this just for you! After reading all the fun everyone was having on the Crochetville Flower Exchange, I was pleasantly surprised to see a lovely flower in this package! I will add a pin to the back and wear it! The keychain animals are the cutest and of course, my girls took off with them immediately! I might have to steal one back! I thought they were so adorable! Anna says these are very popular in Germany and the children put them all over their backpacks. I can see why! Thank you for the two hair scrunchies, too. If the girls don't wear them, I certainly will! Hey, I wouldn't have minded chocolate again (the package certainly took less time in transit this time), but yes, it definitely would've melted this time considering the temperatures now! It's not Winter anymore here! Oh, I just loved the Sheepie things you sent for me. You all are getting me into Sheep collecting! I already have two or three little lambies sitting around here (stuffed animals) and am always on the lookout for other Sheepie things. I love the stickers! I will definitely be using them on some mail to other yarn lovers. 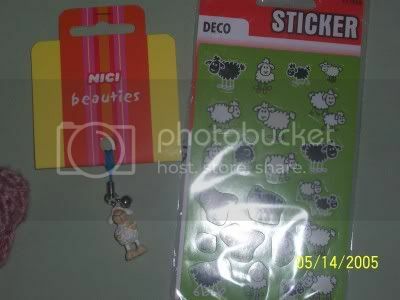 The little Sheepie "Jingle" will always remind me of YOU, "Jinglelady"! Thank you so much, Anna, for being such a wonderful Secret Pal last round. I enjoyed it all, the postcards, the goodies, and now a new friend! I'm sooo glad the package arrived in a timely fashion! I paid the extra to put tracking on it this time, but I'm glad I didn't have to use it. I tried looking to see where it was, but I couldn't figure out the website - cryptic German. Glad I didn't have to ask for help. What pretty yarn Karla!! thanks for sharing the pictures! What great packages! Your girls must have been so excited...right along with you!!! The yarn looks yummy!! Hi Karla. Guess who check your blog spot? Yep, it's me, Mimie. Will be checking up on you as often as I can. Takecare of the family. Oh, of course, I got your mail last nigth. Yeah, yeah, I owe u a letter. Oooops! Bye for now. Great packages! It's so fun to get things isn't it? I'm sorry to hear about your dh's dismissal. May God provide for your needs and guide him into good employment soon.